Housing – or the lack of it – is to the forefront of many discussions these days, from the radio station to the dinner table. Much of the discussion revolves around the same topics of increasing supply, making it easier to build and making it affordable to purchase. 1. How much control does the state really have over housing and the demand for housing? 3. Where does the ownership of property – and the rights and obligations it brings – fit into this discussion? Let’s take these questions one-by-one. Demand for housing is the real issue. Supply reacts to demand, or not in Ireland’s case at the moment. So, what are the drivers of demand? 1. The main driver of demand for housing is the headship rate. This is essentially the number of households that are forming. As people stay single for longer [average marriage age is now 34], or stay single forever (soon it will be 1/3rd of all households), family breakup (9.7% of marriages), empty nesters/holiday homes – these all drive demand for housing and the state has little control over them. 2. The second cause of housing demand is obsolescence and I’ll return to that shortly. 3. The third major driver of housing demand is population growth. In 2016 c.16,000 additional people came to Ireland, 50% of whom chose to live in Dublin city. This has public policy implications. It is difficult for any state to control some of these factors. It also means that real demand for housing is closer to 40,000 units per annum and not 25,000. Obsolescence is the second largest driver of demand, and is perhaps something the State could or should be able to control. This is when houses are allowed deteriorate to a condition where they become uninhabitable. On average, 123 houses become obsolete in Ireland every week, or 6,394 houses a year. •	lack of awareness (especially if owned from overseas). Obsolescence also affects the official numbers upon which policy is made. II. HOW MANY HOUSES ARE WE REALLY BUILDING? The following table from CSO (2016) figures shows house completion rates for Ireland from 2011-2016. These figures show that although nearly 51,000 houses were built from 2011 – 2016, less than 19,000 houses were added to the national housing stock (currently 2,022,895). The difference between the headline figure of nearly 51,000 houses and the net gain is obsolescence. However these official numbers also mask another problem with the way in which we measure housing “completions”. A house completion is not necessarily a new house; a house completion is measured by a new connection to the ESB grid. This could therefore include houses that had been built years ago but never connected, or temporary connections during construction works, or the conversion of a garage to a granny flat, for example. There is estimated to be a 20 percent margin of error in house completion statistics by using this method of measurement. The following table uses official house completion statistics from 2015 to illustrate the problem. 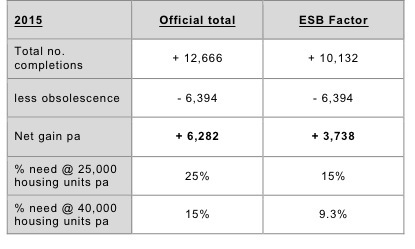 I refer to the 20 percent discrepancy caused by measuring completions by connection to the electricity grid as the “ESB factor”. It can be seen that we did not add 12,666 houses to our national stock in 2015, but at best added 6,282 houses, and possibly just 3,738 houses. It is worrying that we can’t accurately count how many houses we build each year. This also means that we are achieving very little of the required annual housing output target. If an annual housing need of 25,000 is accepted, then we are achieving between 15 – 25 percent of this target; if an annual housing output of 40,000 units is accepted, then we are achieving between 9.3 – 15 percent of our yearly housing need. As each year in which we don’t achieve our targets passes, the need accumulates. 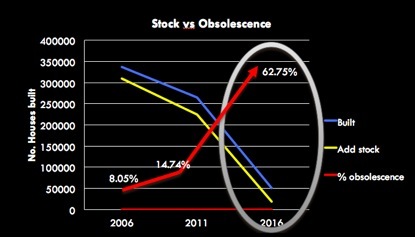 The above table also shows the impact of obsolescence. The impact of obsolescence becomes more critical as the numbers of annual completions decrease, as obsolescence is relatively constant at 4 – 6 percent per annum, whereas the number of annual completions fluctuates. The following chart shows this impact from 2006 to 2016. In effect, this means that for every 100 housing units that are completed in the last five years, another 63 on average have been lost to obsolescence, therefore adding just 37 housing units to the overall housing stock. Graphically, this looks as follows, with obsolescence accounted for in red. •	How is it possible to manage a stock of housing when we have no accurate figures for how large or small it is, or how much we are adding to or subtracting from it each year? •	The impact of obsolescence, as demonstrated above, also highlights that resolving the current housing crisis involves management of our existing stock as much as building new housing stock. •	Obsolescence needs to be a factor in housing statistical calculations and as part of housing policy. •	We require a better way of measuring our housing output. We know more about our farm animals – where they were born, what drugs they received, where they were slaughtered – than we do about our housing. Using ESB connections as a measurement needs to be stopped. A state response to the housing crisis, therefore, should be fifty percent about the construction of new housing and fifty percent about better managing the stock we already have. New construction is a 3 – 10 year project, but managing better the stock we have could start tomorrow. Managing our existing stock better may involve some political challenges, the first being that of ownership. The ownership of land is a sensitive topic, not just in Ireland. Many events of social significance and indeed social upheavals have had property and the ownership of property at their root. Much power, both collective and individual, such as the right to vote, has also derived from the ownership of property. But to manage property better it may well be necessary to challenge certain assumptions about the rights and obligations of ownership. It’s difficult for the state to manage housing better when everybody wants to control their own stock, but it’s even more difficult for the state to manage housing better if some form of control isn’t taken. This means that the state may have to ask some questions about ownership, and about itself and how far it is willing to go in order to balance individual ownership rights and national housing management needs. a. Do property owners have the right to do what they want with their land? b. Do property owners have the right to do nothing with their land? c.	Who should be able to object to an owner doing something on their land? d.	If a person temporarily acquires property to live in, what rights should the original owner retain? e.	Do we need to own all the property? f.	Should property-owners have the right to be anonymous? g.	Shouldn’t there be a public register of beneficial ownership? The courts have shown that they are willing to go further than politicians on issues of property, ownership and their inherent rights. Politicians have been far weaker on issues of ownership, a good example of which is the vacant site levy, which was set at 3 percent of the land’s value – a figure that will challenge no landowner when land values are rising by more than that amount each year. Managing our existing housing stock better is a key factor in resolving the current housing crisis, and one that could have an immediate impact. To do that, however, we need a better grasp on what our stock is and how it is changing each year. Better management may also involve some tough political initiatives in order to encourage owners to use their property and land more productively. The notion of ownership itself, and what it means in Ireland, may be worthy of some immediate reflection. •	What can the state control and what can it not? •	What figures are headline figures and what are net figures? •	What are the rights and obligations of property ownership in 21st century Ireland?